We knew there was a good chance of this happening when we decided to move to Bangkok for 2014. And sure enough, yesterday the Thai military made quick work of dissolving parliament, taking rival political leaders into custody, suspending the constitution and taking power. When I tried to get into one of my favorite malls to check out a bookstore, I was told they were closed early due to a 10 p.m. curfew. 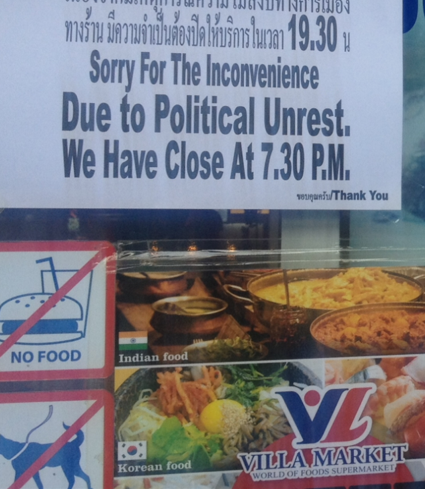 I hurried back home, stopping by a supermarket that was packed with emergency shoppers trying to beat curfew. I got home just before 10 p.m. to the news that the military had taken over all television, including cable. Every channel was tuned to the same military broadcast playing occasional announcements interspersed with patriotic music. Jammie and I looked out of our 16th-floor apartment window and saw increasingly deserted streets. Twitter was buzzing with updates. Commuters were stuck on buses trying to get home. All airports were operating as usual. There were rumors that social media would be next on the chopping block. Some even thought Internet access would be completely shut down. Markets came to life, traffic roared along the streets and everyone got back to business as usual. The last coup in 2006 led to the military eventually handing power back to the people. That was clearly the expectation for the outcome this time around as well. As for us, we are taking it one step at a time. Local expats in the know have a cautiously optimistic outlook. Many have seen this before and have a “This too shall pass” attitude. As for us, we’ll give it some time. Our red line is social media/the Internet. If they go, we’ll go. Stay safe, guys! Thanks for the update. Sometimes change can bring better things. Yah, been there before. Difference this time is the internet and social media. It will be hard for expat and tourists to go without it. So far I haven’t seen any harsh words on the internet so hopefully it’s still on. Stay praying for friends and family there. Hopefully if the internet goes, the international flights don’t go with it. Despite the political unrest, I think it is an eye-opening opportunity to be able to experience these things most people in “civilized” countries know nothing about. This is “every day” reality for the rest of the world. I feel that it will broaden your horizons and change your viewpoint of the world. I know that you two will be safe, especially since plans were already developed for your safety. We continue to pray for your safety! Thanks for the update. Keep safe! Bjorn, thanks for the update and local detail. hope your red line means more the Barry’s. Stay safe and keep us posted.